Disco Is Not Dead, It’s Middle Age Crazy! 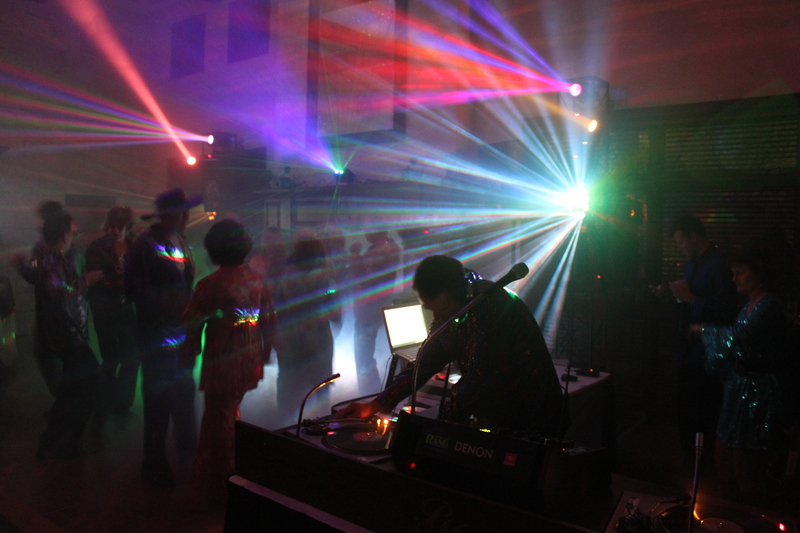 I was thrilled when my old DJ buddy Craige Bandy called and asked me to make his 50th birthday celebration into a full-blown Disco Party. Is Disco Fever having a midlife crisis? Blog readers may remember Craige as a former Party Machine DJ, who won an Emmy® Engineering Award last year for inventing a specialized camera device. Read about that here. Craige and I met over 30 years ago in college, we both had fledgling mobile DJ businesses, and we both worked as night club DJs in some of the hottest clubs in the Dallas-Fort Worth area. When The Party Machine grew into a multi-system operation in 1979-80, Craige became our top guy. The Disco craze was in full swing in our night club years. We lived it, and we know it well. So when Craige said he wanted a “70s Trash Disco” themed party when he turned 50, both of us clearly understood what that meant. LOUD, with bass notes that you can feel. Sub-woofers that shake your bell-bottoms. Flashy. An amazing display of lighting would be required, with clouds of low-lying fog, and “Saturday Night Fever” showing on two big Plasma TVs. High-tech, but with a BIG mirror ball in the center of the room. And lots of sweaty people dressed in shiny polyester constantly dancing, with bad hair and bling. And: Vinyl. That’s right, old-fashioned vinyl records, beat-mixed on turntables the Old Skool way. The vinyl part was easy – I still have every record I ever owned, including all the Disco hits I played in clubs in the 70s and 80s, lovingly filed away in the Party Machine archives. Even better, when one of the clubs where Craige and I both used to spin was turned into a Mexican restaurant, I ended up with the DJ Booth console, and it has lived in my attic for years. Getting it down, cleaning it, and installing first-class pro audio gear was not easy, but we had a Mission! 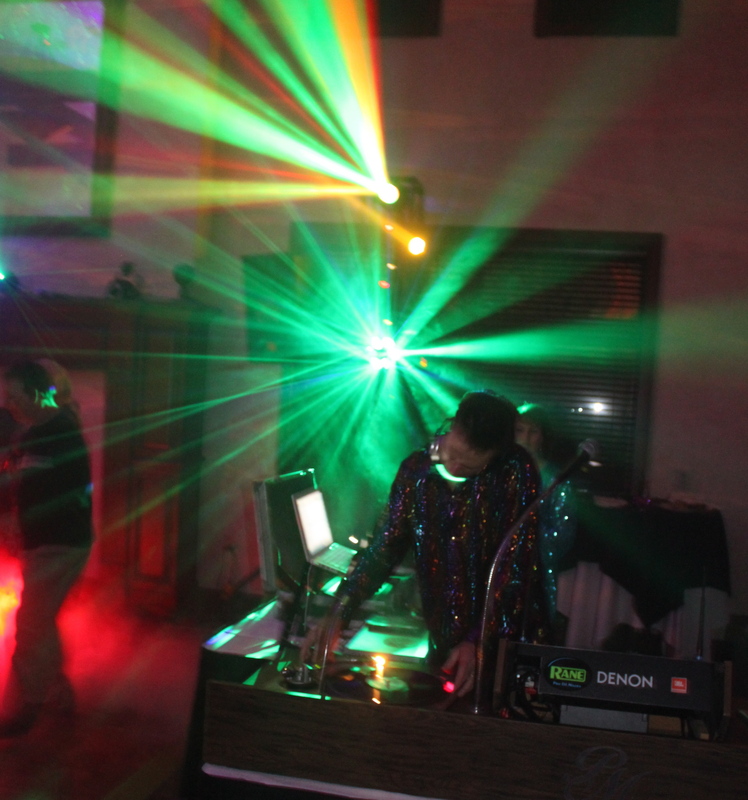 Spinning for Craige’s birthday, with the same DJ Booth we used 30 years ago…well, it had to be done. That's right, turntables and vinyl records! TECHNO-BABBLE ALERT: For you DJs, audiophiles, and techno-geeks, we used original Technics SL-1200 Mk II turntables with a matched pair of Shure M44 cartridges and a Rane mixer, a DBX Driverack, QSC amplifiers and JBL MRX-Series main speakers and sub-woofers. Total system was 4,900 watts, but it was quite adequate for a crowd of 70 people, and crystal clear. In deference to modern technology, I did install a Denon HD-2500 controller in the booth – but we didn’t use it! And we had an Apple computer, with all music backed up on remote hard drives, and even on the iPhone. I confess to playing a couple of tunes on the laptop, but mostly I used it to search the BPM count on some of the records I had not played for 30 years! Craige’s lovely wife Stasia put together a grand event, including planning the music playlists, which she does better than most of the top DJs I know. She knows her music! The invitations emphasized that guests should dress “70s Trash Disco,” and the phones started ringing with costume buzz. Invitees received a small brown cardboard box in the mail, with funky disco lyrics scrawled on the sides, and inside was a written invitation, a party noisemaker horn, shiny confetti and a pair of miniature mirror balls, suitable for…wearing as bling! It was clear this was not intended as just another party, but to be a milestone in the lives of all in attendance. And we planned a bit of showbiz razzle-dazzle, with “red carpet” photos of the costumed guests in the lobby (with a mirror ball, a glittery backdrop, and colored Disco lighting), and a cocktail hour in the bar of the Cowboys Golf Club. Guests would not enter the Disco Room until the “Reveal” moment. We had a separate wireless sound system with speakers in the bar and lobby areas, playing Stasia’s special cocktail hour mix. The wall separating the bar and the ballroom had multiple doors in the center with smoked glass, so guests in the bar would see occasional flashes of moving light, enough to know there was a party next door. The doors opened to the instrumental beginning of Heatwave’s “Groove Line,” and the polyester-clad guests poured in. When the bass riff kicked in, Craige and Stasia glided to the dance floor (as much as you can glide in platform shoes), and the crowd followed in a cloud of color-changing fog. Those who could not cram onto the packed dance floor were all dancing where they stood. The energy level was at fever pitch all night, and we played an extra hour of disco hits before the staff said we had to shut down. So much great old music, so little time! I forgot how much fun that was. I am ready to do it again, in about three weeks. Long live disco! And Happy Birthday Craige. Let’s make this an annual event, if it can wait that long!